FRANKFURT – Porsche AG reported a big surge in first-half operating profit, boosted by continued demand for luxury cars in China and a recovery of the North American market. Operating profit rose to 1.07 billion euros ($1.54 billion) from 675 million a year earlier, the company, which is jointly owned by Porsche Automobil Holding SE and Volkswagen AG, said on Monday. Six-month revenue rose 19 percent to 5.22 billion euros. "Porsche is able to benefit through a very attractive model range from high demand globally for sports cars in the premium segment," CEO Matthias Mueller said in a statement. "Profit and margin are both above expectations," said Juergen Pieper, a Frankfurt-based analyst at Bankhaus Metzler. "Porsche has excellent products with the Cayenne and Panamera and the overall environment for premium cars is very solid." Porsche AG Chief Financial Officer Lutz Meschke said on Monday that the carmaker continues to aim for a "clearly" double-digit operating margin this year. The company's operating margin in the first six months of 2010 was 15.4 percent. "We were able to finance all investments through our cash flow" Meschke said in the statement. "That's the result of our high profit-earning capacity and a very healthy cost structure." Premium and mass-market carmakers have looked to fast-growing markets such as China to make up for sluggish sales growth in Europe. Porsche sold 11,712 cars in China in the first half, a 47 percent rise on last year's figures. In North America sales grew 25.1 percent in the same period to 15,466. China's car market, the world's biggest, is seen cooling this year due to rising fuel prices and tighter rules on car registration. 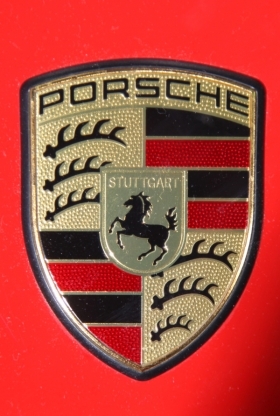 Porsche AG said it aims for record vehicle sales of more than 100,000 this year, with a double-digit operating margin. Overall, the automaker aims to double sales to at least 200,000 cars and SUVs by 2018 by introducing new models and expanding in emerging markets. In the first six months of the year, Porsche's sales increased 26.3 percent to 56,272 units. The best-selling Cayenne SUV accounted for 28,405 deliveries. To sustain growth, Porsche aims to adjust rollouts to have at least one new product each year, sales chief Bernhard Maier said last month. The key model in 2011 will be the seventh generation of the 911, which debuts at the IAA in Frankfurt next month. The revamped car will be more agile than the current version while selling for about the same 86,000 euros that the current basic model commands. Porsche plans to increase production of its best-selling Cayenne model by 10 percent to 20 percent starting next year. Demand for the SUV, which includes a turbo version costing 121,000 euros, caused the waiting list to extend to as much as 12 months in markets including China. Porsche's model lineup with the 911, Boxster/Cayman, Panamera and Cayenne will be expanded by 2013 to include a compact SUV. In the same year, the company will add a limited series of the 918 Spyder hybrid, a 500-horsepower vehicle with a V8 engine and electric motors that has a top speed of 320 kilometers per hour. Porsche may also develop a supercar positioned higher than the 237,600 euro 911 GT2 RS, which currently marks the top end of the 911 lineup, Maier said last month. Additional variants of the Cayman and Boxster, plus extended-wheelbase and convertible versions of the four-door Panamera, are also conceivable, he added. Last week, Volkswagen said it was sticking to plans to integrate Porsche's sports car business but was also "preparing for the eventuality that a resolution on the merger will not be adopted this year," adding it still sees the chances at 50:50. Volkswagen said it remained committed to its goal of creating an integrated automotive group with Porsche, regardless of how it ultimately achieves it. The Porsche SE holding company, which has its own CEO and CFO, will report after-tax results for the first half on Tuesday.